Buyers and investors looking for modern contemporary living may want to consider the Legenda@Southbay resort bungalows by Mah Sing Properties. Situated in Batu Maung, Penang, the Legenda@Southbay is a luxurious development project consisting of three-storey and four-storey resort bungalows in a gated and guarded community. Mah Sing Properties northern region general manager Low Eng Hooi said that there are three variations to the bungalows — Scenic, Deluxe and Grande — which are complemented by a diverse range of features. “Among the features are a private lift, home automation system, a personal pool with a spacious deck, as well as multiple-decked balconies,” he said. A unique feature is that each variation is built on different types of terrain. “The Legenda Grande, for example, has an infinity pool in the lower ground floor which makes it the only four-storey bungalow variation offered at Legenda@Southbay,” said Low. Currently, the Legenda@Southbay is 40% sold and expected to be completed at the end of 2013. The whole development of Legenda@Southbay comprises 76 units with built-up areas of between 6,800sq ft and 7,000sq ft, and a land area of 7,500sq ft. The unit price ranges from RM4mil to RM4.7mil. 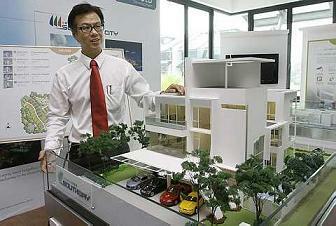 Mah Sing Properties will be highlighting the project to those in the northern states when it takes part in the Star Property Fair 2011 later this month. Touted as Penang’s premier property expo, the fair’s ninth edition will be held at Gurney Plaza and the adjoining G Hotel from July 21 to 24. To date, 28 major developers — representing almost all the big boys in the industry — along with several financial institutions have taken up booths in the fair. The RM30,000 worth of prizes for the ‘Surf, Click & Win’ contest are sponsored by IJM Land. The fair, to be open to the public from 10am to 10pm daily, is organised by The Star in collaboration with Henry Butcher Penang. Admission is free. I have a unit for rent How much can I get? Bayan Lepas price, maximum 5k.